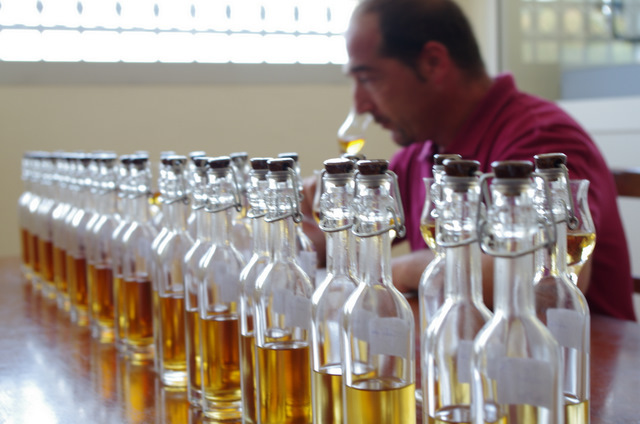 Recent statistical studies on the world of Grappa have shown that consumers manage to distinguish this distillate from the others at first smell. This confirms the very particular olfactory characteristic of our national distillate. In fact, its wealth of fragrances and flavours means it cannot be mistaken for any other aqua-vitae, even if, regarding this complexity, the vast majority of consumers have difficulty in defining or describing it in words. On the other hand, there are Grappa tasting courses for all needs. Grappa is perceived as a distillate be consumed calmly, discovering all its various qualities, at home or after dinner in restaurants or in wine bars; the increasingly severe Highway Code regulations have contributed to favouring the drinking of Grappa at home. This also explains the changed trends in Grappa consumption: an aware approach to tasting of the distillate, which indicates discerning tasting, without any form of exaggeration. Grappa has crossed the national borders, above all, addressing those markets where products made in Italy are highly appreciated, such as in the United States and Canada. But the reference foreign market remains that of Germany, with its great esteem for Italian products. The Asian markets, however, are showing growing interest in our distillate, with a preference for Grappa aged in wooden barrels. The future of Grappa appears to be secure, although much more needs to be done to spread the knowledge of its long tradition and history. But one thing is for sure, when one says Grappa, one also says Italy.